New members have been called to the Relief Society and Primary general boards of the Church. The new members joined other Church leaders on the stand Saturday evening, Sept. 23, for the general women’s session of The 187th Semiannual General Conference. All nine board members currently live in Utah. 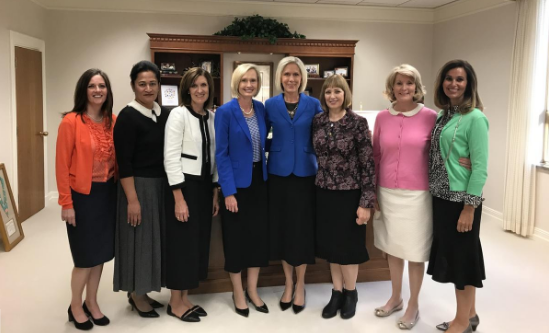 The nine women will work with the general presidencies to help meet the global needs of the Church. The four new Relief Society board members are Melinda (Mindy) Booth, Memnet Lopez, Rebecca Mehr and Susan Porter. Sister Booth has worked in international development and financial compliance and is now a chef in Salt Lake City. She served as a Church-service missionary for the Relief Society general presidency. She enjoys spending time with her 13 nieces and nephews. Sister Lopez was born in the Philippines and raised in Guam. She graduated with a bachelor’s degree in chemistry from Brigham Young University and attended Far Eastern University Medical School in the Philippines for two years. Sister Lopez served a mission in the Illinois Chicago mission. She served with her husband, Marlo, when he was president of the Philippines Bacolod Mission. They have three sons and eight grandchildren. Sister Mehr worked as an engineer and marketing executive in the computer industry and as director of audience needs for the Church History Department. She and her husband, Daniel, served as public affairs missionaries in the Caribbean Area. They also served together in the West Indies Mission when her husband was mission president. Sister Mehr also sang for eight years as a soprano with the Mormon Tabernacle Choir. To read more about the other newly called members of the Relief Society and Primary boards, click here.